Scotland's First National Park was officially opened by Princess Anne on 24th July 2002. Loch Lomond Shores, the principal gateway to the national park, is near to Stirling and just off the A82, about 18 miles North West of Glasgow. Herds of red deer roam in the Park and the wildlife is as varied as the landscape. More than a quarter of Britain's plant species thrive in this rich haven for birds and mammals. Loch Earn, Callander and the lake of Menteith in the East. In the North, the loch is a deep glacial gash in the Highland landscape. Ben Lomond towers over the Loch which is the largest and one of the deepest expanses of freshwater in Great Britain. The wild glens and sparkling lochs between Callander and Aberfoyle are often regarded as the Highlands in Miniature.Visited and enjoyed by many people over the years. The high country of the North has some of Scotland’s finest munros. Ben Lui, Ben Challum, Ben More and Ben Vorlich line the route from Tyndrum to Killin and down through Glen Ogle. Bordered by sea lochs, the Cowal peninsula is watched over by the Arrochar Alps. 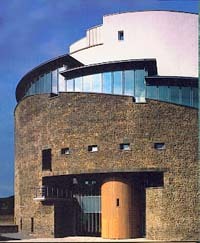 At the visitor centre, Drumkinnon Tower has a 6 storey glazed wall which overlooks the loch. The contemporary design is reminiscent of an ancient scottish castle and two viewing galleries offer stunning views over the loch and north towards Ben Lomond. Facilities include include a 350 seat, large format iWERKS theatre and animated show. an exhilirating 10 minute journey, as you are drawn deeper into the loch and whisked on a fascinating passage through some of the myths and legends of Loch Lomond. the 38 minute giant screen drama discovers the long forgotten story behind the song 'The Bonnie Bonnie Banks of Loch Lomond'...an awe inspiring experience. The centre has 70,000 square feet of shopping and restaurants with daytime catering in the family restaurant, mezzanine cafe-bar or in the coffee shop on the 6th floor viewing gallery. In the evening, there is a licensed restaurant on the 6th floor. Trips can be organised and equipment hired for canoeing, hiking, cycling and hill walking experiences. For children, there is an outdoor play area with climbing structures, slides, swings and quieter interactive zones. A water bus service will operate from Balloch and a shuttle bus also links Balloch Railway Station with loch Lomond Shores every 30 minutes during the day. Loch Lomond can be explored further by taking a cruise or by an open top bus tour to Luss on the Loch Lomond Explorer. The centre is open daily (excluding Christmas Day).